Return to the sprawling universe of the Galactic Commons, as humans, artificial intelligence, aliens, and some beings yet undiscovered explore what it means to be a community in this exciting third adventure in the acclaimed and multi-award-nominated science fiction Wayfarers series, brimming with heartwarming characters and dazzling space adventure.Hundreds of years ago, the last humans on Earth boarded the Exodus Fleet in search of a new home among the stars. After centuries spent wandering empty space, their descendants were eventually accepted by the well-established species that govern the Milky Way.But that was long ago. Today, the Exodus Fleet is a living relic, the birthplace of many, yet a place few outsiders have ever visited. While the Exodans take great pride in their original community and traditions, their culture has been influenced by others beyond their bulkheads. As many Exodans leave for alien cities or terrestrial colonies, those who remain are left to ponder their own lives and futures: What is the purpose of a ship that has reached its destination? Why remain in space when there are habitable worlds available to live? What is the price of sustaining their carefully balanced way of life—and is it worth saving at all?A young apprentice, a lifelong spacer with young children, a planet-raised traveler, an alien academic, a caretaker for the dead, and an Archivist whose mission is to ensure no one’s story is forgotten, wrestle with these profound universal questions. The answers may seem small on the galactic scale, but to these individuals, it could mean everything. Book 1 and 2 had set my expectations high for this 3rd book of the series. I was thinking this is going to be the "finale" book of this "trilogy". That was wrong of me, I guess. All these books are not really continuation of one another, are fairly independent of each other, even though all three are in the same universe. 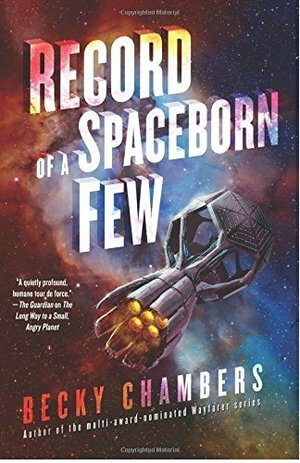 The reason I'm disappointed with this 3rd book is - the entire book felt like "world building", a build-up for something big that's going to happen soon. But nothing of that sort happens. The Oxomoco incident just "happened" and nothing thrilling occurred around that. No sabotage / war plot, no twist reveal or action. Sawyer's story thread looked promising once he joined the scavengers, but that too fizzled out pretty quick. All other characters were insignificant. It felt like tv channel surfing.